The president of Somaliland wishes the conference on Somalia in London all the best, but says they cannot attend as the event ignores Somaliland’s history and reality. The Horn of Africa has for too long been one of the world's most troubled regions. It has been defined, for good reason, by conflict, repression, famine, terrorism and piracy. So it is a sign of hope that 50 countries and organisations will meet in London this week to discuss how to help the new government of Somalia forge a better future for its citizens. This high-profile conference shows Somalia is getting international attention. The new government needs support in rebuilding state institutions and its shattered economy. Britain's re-opening of its embassy last month shows security is slowly improving although recent terrorist attacks in Mogadishu show the scale of the challenge. Somaliland wishes the conference well. Increased international attention and support for Somalia and the wider region is in everyone's interest. But with real regret, we will not be attending. This is not because of any ill-feeling to Britain or to Somalia, who are co-hosting the conference. Britain has been one of Somaliland's staunchest friends and we are hugely grateful for its generous support. We are also now establishing relations with the new government in Somalia. It is just that we cannot take part in a conference that does not recognise Somaliland's unique status or move forward our long fight for international recognition. I accept that this will be confusing to those not immersed in the troubled history and politics of this region. Somaliland is still treated officially by international organisations as an autonomous region of Somalia, but this ignores both history and reality. 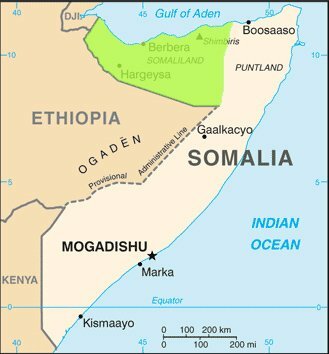 Our two countries were separate until 1960 when a disastrous, but voluntary, decision was made to merge with Somalia. In fact we gained our independence from the UK before Somalia did from Italy. The union, unhappy almost from the beginning, fractured permanently when the Somali regime of Mohamed Siad Barre waged a brutal war against Somaliland in the 80s in which 50,000 civilians lost their lives. As Somalia disintegrated into chaos, Somaliland in 1991 took the opportunity again to control its own future. Over the past two decades, we have worked hard to build a stable and democratic state. We have put in place functioning state institutions including police and armed forces. Terrorists find no safe haven within our territory nor do pirates operate off our coasts. Since 2000, we have held five national elections, judged by international experts as free and fair, which have seen power transferred peacefully. Our government has introduced free primary education for girls and boys. Progress is being made in reducing child mortality and female genital mutilation. Foreign investment is beginning to flow back in to help strengthen our economy. There are, of course, many challenges still to overcome. Somaliland remains poor – it takes time to recover from the devastating impact of such a brutal conflict. But by providing a virtual oasis of good governance, peace and security in the Horn of Africa, we are shaping a better future for our country and citizens. This future includes a better relationship with our neighbours in Somalia. We have actively pursued dialogue and, last year, I signed an agreement with the former Somali president, Sharif Ahmed, to build trust and improve relations. On 13 April this year, I met President Hassan Sheikh Mohamud in Ankara to resume the dialogue. We have set out an ambitious agenda to work together to tackle terrorism, extremism, piracy, illegal fishing, toxic dumping and other serious crimes. Such co-operation is important not only for our two countries but also for the wider region and world. But such partnership also requires agreement and international recognition of a permanent political settlement over the status of Somaliland. We are not asking the international community to take a chance on what Somaliland might become or build. We simply want recognition of the reality that has now existed for 20 years. From 1960 to 1991, we gave unity a chance. It failed disastrously. We have now forged again our own future. We deserve the chance to fulfil our ambitions. This is why, although we wish the conference in London well, we will not be attending. And why we hope that we can soon play our role in building peace and prosperity across the Horn of Africa as full and equal partners.